The 2014 midterm elections are rapidly approaching. Next week many Americans (well, probably more like 40% of them) will head to the polls to decide the composition of Congress during the remainder of Barack Obama’s presidency. Healthcare, immigration, the administration’s treatment of the Iraq/Syria conflict and latest Ebola outbreak will serve as prominent avenues of attack for the GOP and points of retreat for many Democratic candidates. As always, conservative candidates have indulged in their usual series of idiotic statements, ludicrous claims (see above), and childish behavior. The Democrats have likewise made their fair share of ill-advised advertisements, statements and non-statements all topped off with a healthy dollop of academic dishonesty. Not limited to the partisan frey, even universities are getting in on the action this year. Indeed, there has been no shortage of jaw-dropping gaffes and the cross-aisle bickering remains as as fervent as ever. However, there is a distinctly muted aura that has surrounded this year’s campaigning. Even with the fate of the Congressional majority hanging in the balance, Americans simply aren’t interested in next week’s election, and it shows. As a result, the media has produced a startlingly broad consensus on two primary and very much intertwined electoral themes. First, you have a unanimous forecast of an overwhelming Republican victory. Estimates currently place the chance of a successful Republican consolidation of a Senate majority at various degrees of likelihood. Most exceeding 50% by a very comfortable margin and have been increasing steadily since about mid-month. The Washington Post place the chances of a GOP victory in the Senate at 93%, The New York Times puts them at 66%, YouGov at 63%, and FiveThirtyEight at 62.3%. While this is certainly in line with the majority of the statistical models, the (editorial, not mathematical) certainty with which these predictions are being touted is unusual. Consequently, the dominant narratives have been those featuring liberal America lethargically resigning itself to a predetermined result. Interestingly, the introduction of “big data” to mass media and the rise of the infographic have given a new angle to the American love of statistics and cemented the role of the pollster in contemporary politics. It seems as though the “triumph” of nerd-prophet Nate Silver in predicting the outcome of the 2012 Presidential election has inspired a sense of reverence among a new generation of Americans (at least those who consume news media) for the projections of popular number-crunchers. Backing up these relatively dense and technically-oriented predictions have been a series of pieces that remind the electorate of these conclusions. Even back in September, Fox News’ headlines have highlighted the “gloomy” democratic prospects, while Hill contributors are certain of the GOP’s “big victory in the Senate, House and statehouses”, and Bloomberg editors jumping at the chance to “be the first to congratulate Republicans on their victory“. While I am certainly not suggesting that the Democrats are likely to win (or even retain control of the Senate), dismal Democratic midterm performances may not be as certain as the President may think. The second, and far more amusing, theme of the upcoming election is the absolute insistence that they are both a) boring and b) not even really about anything substantial. The extent to which the media has rallied around this motif is impressive. Nate Silver, the aforementioned patron saint of millennial stat-fodder, said back in mid-2013 that this is “not a super interesting year in politics” and proclaimed that the 2014 midterms will be “dull“. The Atlantic ran an article from Peter Beinart that explains how the relatively “low stakes” of this election are to blame for the fact that it’s “so boring“. New York Times contributor David Brooks called it “the most boring and uncreative campaign I can remember“, while The New Republic ran an article with the title It’s Not Just You. The Midterms Are Boring. Even the more vigorously partisan outlets are running the message: The American Conservative published The Boring Midterms about the aforementioned Atlantic piece while MSNBC’s Morning Joe discussed David Brooks’ remarks. This is taken a step further by several outlets claiming that not only are the midterms boring, but they don’t even have any substance to speak of either. An NBC article proclaimed that “the 2014 election sounds at times like a campaign about nothing“, while The New Republic’s Guide to Midterm Elections asserts that “if you want to talk about policy, you’ll have to wait until 2016“. Gloria Border of CNN capitalized on the sentiment of the former, explaining that “to a degree, this is a Seinfeld election, a show about nothing“. While the majority of these articles admit that the election results will likely not be inconsequential, they’re all united in condemning the vapidity of political discourse as if it were unique to this particular election. The battle for control over the trajectory of American politics exists much as it has for the past few decades. The intense political polarization of Americans is well–documented and looks to be increasing with each passing year. I’ve written before about how so-called “Independents” are really anything but and the decreasing number of swing voters in America is fast becoming a defining element of electoral strategy, two points raised by Lee Drutman and Mark Schmitt in their Washington Post article The 2014 campaign is a campaign about nothing. As familiar as we now are with this theme, Drutman and Schmitt astutely judge that the acute lack of “ideological overlap” between parties and lack of incentives for aisle-crossing centrism are driving the high-cost/low-substance character of the 2014 elections. The intense and deep-seated polarization in Congress reflects the American flight from the center. While the 2014 midterms may come to be defined by their monotony, there are still a few reasons to tune in. For one, there are a few interesting candidates. There’s a cartoon cat-tie wearing pizza guy (who “actually does” smoke marijuana) and an American (almost) Idol, both pursuing Congressional office. There are also a few (legitimately) important issue items such as the potential “second wave” of marijuana legalization which could have profound effects, not only on the future of the drug’s legality on a national scale but also on the recently reinvigorated debate over D.C. statehood. The success of certain campaigns will likely also influence the future of the debate surrounding “dark money” in politics and the 2010 Citizens United ruling. Of course there is also the off-chance of an upset victory. This is most interesting in the case of Kentucky Democrat Alison Lundergan Grimes, who is benefiting from the public assistance of populist heavy-hitter Sen. Elizabeth Warren in her attempt to attempt to unseat the current Senate Minority Leader, Mitch McConnell. Besides, there’s always the presidential election looming in the distance. And if you think that the problem with this election is a lack of exciting new blood, just wait until we’re confronted with Bush vs. Clinton in 2016. Coming of age in an era of acute instability, the American Millennial generation’s formative years have lacked the pervasive confidence that buttressed previous post-war cohorts and hastened the development of cultural pillars that engender generational success. The Silent Generation (1920s-early 1940s) encountered adulthood at the early peak of modern American power, with a sense of steadfast absolutism guiding the country to superpower status and introducing idyllic consumerism to the masses. Throughout their youth, the Baby Boomers (1940s-1960s) busied themselves with a clearly defined (if frequently ill-conceived) agenda of maintaining world order in the name of Western progress during a period of domestic affluence. Generation X (1960s-early 1980s) was perhaps the first to encounter any sort of overarching ambiguity, though the gentle decline of the US as the singular world power was offset by the collapse of the Soviet Union and continued domestic economic prosperity. While American Millennials don’t lack generation-defining moments, those available are distinctly less inspirational than those of their parents and grandparents. Early Millennials have the misfortune of being old enough to remember the relative luxury of the 90s to juxtapose against more recent experiences that have created a narrative dominated by continued folly on both the international and domestic scale. Combined with two ruinous wars in the Middle East and an exceptionally belligerent War on Terror, the recent recession has left America’s economy and international standing in severely diminished. Uncertainties over the country’s political destiny as well as anxiety over personal economic matters have given rise to remarkable levels of disdain, disappointment, resentment, and disaffection within the Millennial cohort. Unsurprisingly then, identity is being increasingly defined in negative terms. Tepid anxiety has begun to replace irreverent confidence in the national identity. Young Americans are being reared in a culture that stresses an aversion to things that are seen as harmful or counterproductive, where mistakes are to be avoided at all cost. In the public sphere, groups and movements are prone to defining their missions from a platform of active resistance in lieu of deliberate constructivism. Curiously, this phenomenon, a result of decreasing opportunity and socioeconomic mobility, has coincided with increasing levels of political polarization. The popularization and banalization of fanatical opposition (often among Baby Boomers and Gen Xers frustrated with the contemporary reality) to the perceived enemy has collided with the jaded attitudes of Millennials to create an atmosphere of extreme apathy, where civic participation is perceived as synonymous with acquiescence to extremism. Politically, this trend has produced a generation, as well as a status quo, that can paradoxically be defined as being “viciously apathetic”. A 2013 Harvard Public Opinion Project poll produced an article in the Harvard Political Review entitled Angry, Yet Apathetic: The Young American Voter, found that while a majority of millennial voters (52% of Democrats and 51% of Republicans) would like to recall every member of the US Congress, only about half of those respondents had definite intentions to vote in the upcoming midterm elections. Certainly, there is plenty of reason to be dissatisfied. The failure of President Obama’s administration to deliver on many of his campaign promises has put a highly-visible dent in the Democratic Party’s attempt to perpetuate the surge of interest and activity that came as a result of the 2008 campaign. With one of the least productive Congresses in history, young Americans have inherited a system of unimaginable dysfunction and intransigence. This has been compounded by the entrenchment of a quasi-oligarchic political order that has seen influence taken from the democratic masses and concentrated in the hands of the financial elite and now-ubiquitous “Super” PACs. While conventional thinking dictates that soaring levels of discontent among Millennials would result in a proportionate increase in political participation, this is not borne out through the facts. The aforementioned Harvard poll revealed that 75% of participating 18-29 year olds didn’t describe themselves as being “politically active”. If anything, this dissatisfaction has led to a sort of self-imposed restriction on participation. This overwhelming institutional distrust has driven half of Millennials to self-identify as politically independent (a 10% increase over Gen Xers and a staggering 18% more than the Silent Generation). While this hasn’t resulted in the creation of a viable political alternative or even a tangible effect on voting patterns, it is certainly an appropriate representation of the general attitudes at play. The name of the game is objection. It has become, above all else, important to know what you don’t want. Emphasis is constantly being pulled away from the merits of compromise and productive dialogue that is essential for the American government to function and instead placed on the sensation of opposition. The logic appears simple. It is, without a doubt, difficult to imagine viable alternatives and work, slowly but steadily, towards effective reform. By contrast, it’s extremely easy to slam the opposition, invent controversy, and laugh at the lunatic fringes. This represents a critical roadblock to contemporary success and perhaps the ultimate pitfall of American-style democracy. Our first-past-the-post take-it-or-leave-it two party system fails to reward participation by providing for all but the most monolithic of majorities and wealthiest of donors. A brilliant Salon editorial by Matt Ashby and Brendan Carroll portrays the distinctly Millennial reliance on irony and apathy as a coping mechanism. By channeling the apropos musings of the late David Foster Wallace, the authors assert that “lazy cynicism has replaced thoughtful conviction as the mark of an educated worldview”. Indeed, American Millennials are a generation that, almost out of necessity, has embraced irony to an excruciating degree. Wallace places the origins of contemporary pessimism in the cultural backlash that followed the volatile 1960s, during which time an overarching “mood of irony and irreverence” took hold. While this initially fueled productive manifestations of popular outrage in the “global” 60s, it would eventually be co-opted by the pillars of mainstream culture by the 1990s. The late 90s gave birth to reality television, an addictive brand of entertainment that flatters viewers by raising them up above the level of the general(ly ignorant) public. Simply by tuning in, watchers could satiate the nagging desire to feel superior to their fellow citizens. Despite its rather flimsy appeal, reality television continues to be a programming staple. In a similar vein, the new millennium has seen irony flourish on an excessive scale. The advent of hipsterdom (see: Normcore) and the kale-ification of gentrifying forces are the result of lazy and defensive cynicism that preempts failure and subverts risk. The attitude is evident in many strands of contemporary culture. It manifests itself equally in the diminutive reaction to the advent of Patriot Act-style of domestic authoritarianism as it does in the popularity of American Apparel. While it is easy to romanticize iconic movements of the past, it is impossible to ignore the stark differences between the anti-establishment movement of the late 1960s and the recent Tea Party and Occupy Wall Street movements, which (in a profoundly characteristic manner) managed to be simultaneously virulent and ineffectual. An opportunity has arisen, however, to transcend the bounds of our dependence on crippling cynicism. As a generation, we have both the circumstances and the ability to use our unprecedented levels of diversity and education to harness the power of dissatisfaction in a productive manner. To do this, it is essential to embrace nuance and accept that failure is necessary element of eventual success. An emphasis on discretion is the key to popularizing productive engagement while avoiding the pitfalls of forces in popular media that divide as they conquer. Polarization is good for business and keeps otherwise irrelevant brands alive, but it often halts progress in its tracks. Millennials, as a generation, have the task of fostering an environment that doesn’t consider passion in advocacy and participation equivalent to extremism. History has demonstrated that the fruits of civic engagement are not effaced by the ease of recidivism. While it is true that the current system is affected by powerful anti-democratic forces, to participate in the political system is in no way a tacit endorsement of this. Engagement is useful and can’t be considered synonymous with surrender to blind adherence. Above all, we know that the cure to the ills of our political dysfunction will not be found in smug condemnation. Those who have seized control of the American political system win when sensationalism and division are allowed to succeed in encouraging young people to self-disenfranchise. While the Millennial addiction to ironic angst can be traced back to fairly benign roots, it’s actively detrimental to American democracy and needs to be addressed. One of the primary talking points to surface in the wake of Chris Christie’s ambition-dashing scandal, ‘Bridgegate’, is the importance of ‘aisle-crossing’ moderates in American politics. It’s no big secret that the partisan gulf remains 0ne of the most problematic elements of democracy in the US. The gap, which continues to widen as mainstream neo-conservatism has gained ground, is reflected in record-low public confidence levels. Recently, a Washington Post and University of Virginia study found that 69% of respondents felt that the largest threat to the continued existence of the American Dream is the lack of cooperation in Washington. The current spotlight cast on Governor Christie has had the side-effect of bringing American centrism to the forefront. Considered widely to be a Republican front-runner for the 2016 Presidential election, Christie’s success (or lack thereof) in the aftermath of the scandal will likely have symbolic repercussions on the credibility of moderates and the bipartisan project for years to come. While the government shutdown of late 2013 represented a significant setback to those who remain committed to productive and conciliatory politics, there are still those who believe in crossing the partisan divide. Notorious aisle-crosser Susan Collins, a Republican senator from Maine, was joined by five other GOP Senators in voting to allow the progression of a bill that would extend benefits from the federal government to Americans experiencing long-term unemployment. It’s absolutely crucial that efforts like these do not go unnoticed. Using the long-term unemployment bill as a case study, we see that the majority of Republican leadership stands in stark opposition to a compromise. Firebrand Florida Junior Senator Marco Rubio continues to deny that income inequality plays a significant role in the country’s on-going struggle with underemployment in the ailing economy, and remains adamant in finding an alternative to(as oppressed to improving) the White House-sponsored plan. After an erratic (if not downright manic) 2013, during which he played a prominent role in perpetuating the government shutdown, presidential hopeful Rubio kicked off the new year with a speech about poverty in America that slammed the unemployment bill and Democratic strategy. In his speech, the Tea Party superstar outlined a series of policies designed to implement a distinctly Republican-flavored agenda of austerity-based reform. While the Democratic caucus is certainly not rushing to the negotiating table, the proposals of Rubio and his caucus are clearly designed with a priority placed on defeating the White House’s ambitions and not on the creation of a plan to rectify the country’s embarrassing levels of poverty and umployment through traditional means (i.e bipartisan compromise). Republicans these days tend to ignore poverty altogether or to blame it on the poor themselves. Rubio, the Senator from Florida with well-known presidential aspirations, took a different approach on Wednesday. He talked about the persistence of poverty as a crisis. And he made some policy proposals along the way. That doesn’t mean they were good proposals. It is plain to see that partisan ideologues have claimed a disproportionate amount of public attention in recent months. Culminating with the government shutdown, the far-right’s efforts to derail the democratic process and hijack centrist discourse have been met with surprisingly little resistance. However, a recently released Gallup study has diverted a fair amount of media buzz away from the now-normal narrative of partisan clashes. The new report, constructed from an aggregation of ’13 separate… multiple-day polls’, shows that a ‘record high’ (42%) number of Americans now self-identify as political independents. Naturally, this spawned a litany of sensational headlines from the blogosphere decrying the death of party politics in the United States. Bloggers like Care2’s Kevin Matthews have predicted trends in America’s heavily-‘Independent’ future such as a ‘shift away from Conservativism’ and a ‘fall (strikeout) dip of the Two Party System’ that not only flies in the face of established logic, but also ignores an overwhelming amount of evidence that points to the continued polarization and entrenchment of both parties at opposite ends of spectrum. The reality, however unfortunate, is that the shift identified by Gallup is likely far more superficial than a such headlines suggest. The public’s retreat from major party affiliation is, unfortunately, not the sign of an ideological revolution. Rather, it should be viewed as a symptom of the reflexive response that has been developed by the public at large against any close association with the extremist antics so common at the fringe. The American electorate is not rejecting the two major political parties, nor is it demanding establishment of a viable third party. Instead, Americans are simply refusing to be publicly associated with political outliers. The extremists that exist at the outside edges of acceptable party ideology have been publicly rejected and privately revered, much as they always have been since the country’s inception. If anything, citizens are simply becoming less willing to out themselves as party-line voters, even if they continue to behave as such. Why, then, does 40% of the American population self-identify as ‘Independent’ while behaving to the contrary? What is the aversion to declaring party allegiance? The answer is, as usual, disappointingly simple. The reality, as betrayed by all of the available evidence, is that an overwhelming majority of American ‘Independents’ adhere just as strongly to major party ideologies, agendas, and candidates as ever before. It is merely the labels that have changed. While the number of those who claim to be politically Independent is certainly on the rise, tangible results have been few and far between. Voters have elected only two ‘Independent’ Congressman. Both are Senators from New England (Bernie Sanders from Vermont and Angus King of Maine) and both have swiftly joined the Democratic caucus after being elected. There are currently no registered Independents occupying seats in the House of Representatives. Likewise, there has not been a US President without major party affiliation since President Andrew Johnson’s failed Nation Union coalition push in the 1860s. Despite the recent surge in visibility of movements like Libertarianism, veritable Independents that actually vote ‘Independently’ compose a very small portion of the electorate. Poll data from the Gallup survey show that 47% of Americans either affiliate with or lean towards the Democratic Party, with 41% enjoying a similar relationship with the Republicans. The ‘40% claim’ needs to be read with this in mind. This perception of partisans leads ordinary people to be embarrassed about admitting – including to pollsters – that they identify with a political party. Instead, people have come to believe that they will make a better impression if they say they are independent. Indeed Krupnikov and Klar, conclude that the recent increase of ‘Independent’ (non) party identification has produced little in terms of change in the voting public’s ‘actual political views’. Writing in Politico, Poli-Sci professor Alan Abramowitz of Emory University provides further support for phenomenon of what he has labelled ‘closet partisan[ship]’. Despite the fact that more and more voters are eschewing party labels, Abramowitz points to the fact that ‘almost three-fourths of independents surveyed by Gallup during 2013 indicated that they leaned toward one of the two major parties’. He believes that despite the shift towards superficial nonpartisanship, Americans are in fact becoming increasingly divided on party lines. Abramowitz points to data from the 2012 American National Election Study to illustrate his argument. Not only did the report show that over 85% of ‘Independent Democrats’ (87%) and ‘Independent Republicans’ (86%) voted for their party’s candidate, but ‘Independent Democrats’ were more likely to vote a straight Democratic ticket than those who reported a weak affiliation with the party. These results are entirely in line with the general decline of ‘split-ticket’ voting patterns, yet another factor contributing to the growing chasm between progressives and conservatives. It would be irresponsible to highlight the increase in ‘Independents’ without simultaneously giving lip service to the drop in self-identified Republicans. This is an area where the aforementioned desire to publicly distance one’s self from the fringes is especially apparent. The contemporary Libertarian agenda, for example, shares a large number of core values with what is now considered to be the Republican ‘old school’. If anything, the Millennial predilection for Libertarian affiliation should be viewed as a successful rebranding effort, and not an idological shift. The two movements share many elements of their political platform including: the virtues of ‘bootstraps style’ self-determination, regressive taxation, international isolationism, strong national defense, and an unwavering belief in American exceptionalism. As seen in the graphic above, the Gallup poll shows a sharp rise in Independent affiliation in the fourth quarter of 2013, a period that contained both the government shutdown and rollout of the Affordable Care Act. This seems to support the notion that the increase in ‘Independent’ self-labeling is, in large part, a knee-jerk reaction by voters who are capricious enough to be significantly affected by day-to-day developments in Washington. Extravagant amounts of media sensationalism and spin on topics such as the Obamacare rollout, Benghazi mission attack, and NSA domestic spying scandal, have produced equally high levels of distrust in the machinations of the government. ‘Crooks and liars’ rhetoric, a disturbingly popular excuse for non-participation in America, is as pervasive as ever. Vast swathes of the population have adopted an aggressively apathetic tone and have found a comfortable, if temporary, home under the cover of ‘Independent’ self-identification. By playing off of the young conservative voter’s fear of being associated with the socially regressive neo-conservative movement of past generations, the Libertarian movement has successfully co-opted many would-be Republicans into its own ranks. This is certainly not limited to the younger crowd, though. A significant number of Baby Boomer-era (former) Republicans that hold traditionally conservative values are jumping ship as well. As the Neoconservative Right continues to abandon a reasonable conservative platform in lieu of one that plays to the extreme periphery of the party, moderate Conservatives will continue to abandon their cause. The neo-conservative commitment to such radical policies (such as: incessant climate change denial, refusal to recognize marriage equality, aversion to ‘common sense’ gun control legislation, removal of the social welfare safety net, commitment to the continued corprocratic influence, and the nonsensical perpetuation of the War on Drugs) is another factor driving a significant number of Americans away from major party affiliation. While this may not account for the majority of the trend towards ‘Independence’, it is plain to see that the demographics of the ‘newly Independent’ and ‘formerly Republican’ have heavily overlapped in recent years. While the authors of the Gallup report believe that the increasing level of Independence ‘adds a greater level of unpredictability to this year’s congressional midterm elections’, there is little actual evidence to support this. If anything, it is likely that the discontent felt by the vast majority of self-identified ‘Independents’ will result in higher levels of voter abstention rather than a grandiose wave of political coat turning. That is to say, this phenomenon is first and foremost a manifestation of the pervasive desire to ideologically disassociate from the embarrassing political establishment rather than any positive ideological shift. At the end of the day, the increase in ‘Independent’ identification among American voters has much more to do with falling levels of confidence in the dysfunctional establishment than it does with any real shift in political allegiance or beliefs. As long as the intransigence of Washington lawmakers is continually glorified and the efforts of the far-right to destabilize and discredit the political process are tolerated, the number of Americans who are too embarrassed to publicly identify with a major party, especially the GOP, will continue to rise. Over the past few days, our nation has chalked up two more attacks to the ever-increasing tally of gun violence. Puzzling and shocking as they are, we really should be accustomed to it by now. From the head-scratching public suicide of the “Mall Shooter” in New Jersey to the back-room poker game shooting in Detroit that the police chief labeled “urban terrorism”, these recent episodes have reinforced the fact that there has been no reprieve since the tragic shooting at Sandy Hook Elementary School in December of 2012. 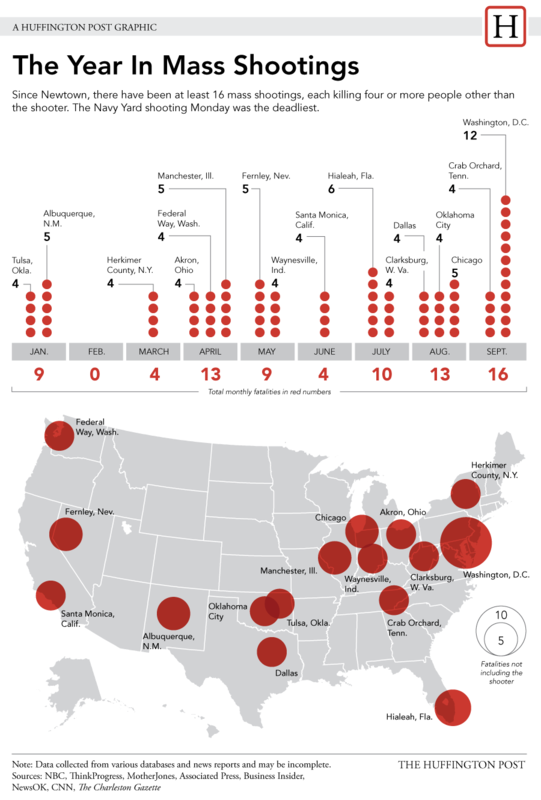 American mass-shootings have persisted at the rate of nearly two per month over the last few years. Despite overwhelming public support (to the tune of ~90%) for several gun control measures such as federally mandated background checks, the government’s failure to adopt even the most bare bones legislation has come to represent one of the Obama administration’s largest second-term failings. The President’s futile expenditure of political capital in the wake of the Sandy Hook tragedy has cost him, and by extension the rest of the nation, dearly in term of deterring future gun violence. Even beyond the failure of newly-introduced legislation, law-makers have again failed to renew the Clinton-era Federal Assault Weapons Ban, a message which reflects a tacit endorsement of private assault-weapon ownership. Two internationally recognizable facets of Americana, lax gun legislation and the deification of the Second Amendment, remain puzzling propositions to those not raised in or around communities in the United States, where gun ownership is a point of civic pride. Best represented by Charlton Heston’s “cold dead hands” declaration, it is undeniable that gun ownership has become, to many, an inextricable element of American identity. The commitment to private ownership, and often public display, of firearms represents an essential component of contemporary notions of American exceptionalism. In addition to our unwavering commitment to a global military presence and a “free market” approach to commodified healthcare, the belief in widespread and unregulated firearm ownership is another domain in which America continues to tread against the global status quo. While gun control opponents readily refute comparisons of European statistics as “apples to oranges” when considering the entrenchment and historic political significance of American gun ownership, legislative measures have produced overwhelmingly positive results in countries with a similarly inflated reverence for firearms. Australia, for example, began an ambitious gun buyback program in 1997 that led to a significant reduction in firearm related deaths. A follow-up study conducted by Andrew Leigh of Australian National University and Christine Neill of Wilfrid Laurier University concluded that in the decade that followed the National Firearms Agreement’s implementation, statistics “show drops of 65% and 59%” (in firearm-related suicides and homicides, respectively) without a significant change in non-firearm related incidents. The success of the Australian legislation led former Australian Prime Minister (and notable George W. Bush ally) John Howard to pen an op-ed entitled Brothers in Arms, Yes, but the US Needs to Get Rid of Its Guns. Citing the “huge cultural divide” between the two nations on the issue of gun control, Howard believes that the choice of the US to shun pragmatism and the safety of its citizens in favor of radical exceptionalism and revolution-era legislation has been disastrous. Reading the full text calls into question the blatant disregard of gun advocates in organizing any semblance a “well regulated” civilian fighting force within which citizens would use their firearms, as mandated by the text. The question of why the Amendment’s second clause is allowed to exercise absolute supremacy over the preceding phrase in contemporary discourse remains unclear. What is clear, however, is that the American aversion to gun control has much less to do with historical fidelity or a commitment to individual rights and has much more to do with the paranoia-fuelled “culture of violence” that exists in America. It remains plainly obvious that gun ownership concerns are not truly connected to fears of a tyrannical federal government, as proponents often like to suggest. If this were the case, special interest groups like the National Rifle Association would probably be more concerned with reigning in military spending and the fact that the USA fields the most powerful military that the world has ever seen. As a nation of immigrants, public distrust for the federal government is practically an endemic feature of history in the United States. Owing much to the emphasis placed on local and community-level civic engagement, Americans, especially those in the more sparsely populated central and southern states, remain actively hostile towards “top-down” legislative reform on the federal level. When combined with the pervasiveness of America’s exceptionalist tendencies, anti-reform sentiment is widespread. While other countries have embraced “common sense” revisions to national-level legislation on firearms, the United States remains intransigent. While 17 of the world’s most prominent nations included provisions for the right to personal firearm ownership in 1875, today the number has fallen to three. The failure to adopt reasonable firearm legislation is, unfortunately, just another manifestation of the United States’ widespread refusal to adapt itself to the contemporary era. While today’s America remains exceptional, it is all too often in areas like evolution denial, incarceration rates, and energy consumption. Similarly, rates of gun ownership in the United States are the highest in the world. In fact, Americans own approximately nine guns for every ten citizens, approximately twice as many firearms as the Swiss. The mythology of the responsible Swiss gun-owner is terribly popular rhetoric for the anti-gun control advocate, though the evidence of recent studies has diminished its relevance. In the same vein, military spending is another arena in which the America reigns supreme. With an annual defense budget that eclipses those of its closest competitors (the US commits about six times more capital than the next largest spender – China), the country displays little hesitancy in deploying military forces to project power across the globe. It may come as a surprise, however, that more Americans have died in gun-related incidents since 1968 than in all major military conflicts in national history. Gun control opponents most often point to the fact that violent crime in the United States is falling as evidence that gun-control concerns are unfounded. While it is true that the 24-hour international news cycle, among other things, have sensationalized events and distorted public perceptions of the pervasiveness of violence, rates of gun violence in the USA remain astronomical when placed alongside those of comparable countries. A recently completed study that was rushed to publication in the wake of the Sandy Hook shootings has worked to debunk the common American mythology that the proliferation of gun ownership works to deter gun crime. Published in the American Journal of Medicine, the study turned up two especially interesting (though hardly surprising) conclusions. First off, the report showed a strong correlation between the number of guns per capita and the number of firearm-related deaths in a given country. The United States, unsurprisingly, finished at the top end of the spectrum (representing high firearm ownership and mortality rates) with Japan on the other. Second, the most significant outlier in the data is represented by South Africa. Despite having significantly fewer guns per capita than the United States, the Republic of South Africa experiences a similar number of firearm-related deaths. This is noteworthy as South Africa is among the countries that boast a significant “culture of violence” that rivals that which exists in America. While the historical circumstances are certainly not the same in the two aforementioned countries, the findings certainly reinforce the notion that, in addition to the raw availability of firearms, there are more complex and nuanced cultural factors that drive gun-violence rates. A common argument points to deficient mental health provisions as a primary factor in American gun violence. A recent Gallup study found that more Americans fault the mental health system than the rampant availability of firearms for causing mass shootings. It is important to note that, had the proposed Spring 2013 gun legislation passed through Congress successfully, the Navy Yard Shooter would not have been able to legally purchase the firearm that he used in his now-infamous spree. While the feeble mental health infrastructure and poor availability of public programs in America almost certainly exacerbate already abhorrent levels of gun violence, placing blame on them does little to negate the glaring need to address faulty and obsolete laws regarding firearms. Improvements absolutely need to be made, but they alone will not sufficiently prevent future incidents of gun-violence. The American culture of violence remains extremely difficult to quantify in any categorical terms. Unsatisfactory (and deeply unsatisfying) explanations range from those that blindly scapegoat violent video games to more arcane explanations like the one offered by New Hampshire Senate hopeful Jim Rubens. The former State Senator blames the simultaneous triumph of feminism and downfall of the modern working man for contemporary gun violence, explaining that the “increasingly female-centric economy” has led to inflated levels of violence. Crackpot theories aside, gun violence, especially in the form of public mass-shootings, continues to make America exception in all of the wrong ways. This fact does not seem to bother Americans either, as the reduction of gun violence ranked among the least important of the major contemporary political issues that deserve Washington’s attention. No other advanced nation endures this kind of violence. Here in America, the murder rate is three times what it is in other developed nations. The murder rate with guns is 10 times what it is with other developed nations. And there’s nothing inevitable about it. It comes about because of decisions we make or fail to make, and it falls upon us to make it different. A video of his address is located here. The ongoing government shutdown and Congressional stalemate over the government’s ability to fund its programs has highlighted an essential element of contemporary American Zeitgeist. Financial backing for the Affordable Care Act, which was passed into law in March 2010, has run aground while facing opposition from a very vocal Republican minority within the House of Representatives. The anti-healthcare contingent has demonstrated that it has no qualms about doing wide-rangvoiling damage to the government of the United States or the American citizenry in order to divert national attention to their agenda. Despite the fact that Obamacare remains a fait accompli, the far-right remains convinced that by obstructing the continued operation of the federal government, they will achieve their goals. Welcome, everyone, to the post-democratic era of American politics. The shutdown has come as the manifestation of an increasingly stagnant legislature that has produced record levels of dissatisfaction among constituents. Aggregated across multiple polling efforts, Congressional approval ratings are currently peaking just a fraction above 10%. As discontent with Congressional intransigence continues to swell, especially among disaffected Millenials, the age-old American myth of unadulterated self-reliance has been given a new lease on life. An excellent example of this, if you’ll remember, was the Romney presidential campaign’s attempt to decontextualize the ‘If you have a business: You didn’t build that’ soundbyte from a July 2012 speech by the President. While it remains blatantly obvious to any casual observer (or, in fact, anyone who bothers to read the line in context) that the president was not suggesting than an omnipotent central government was responsible for the success of small-business entrepreneurs in America, that did not stop the GOP from pushing their agenda of finger-pointing and birther-esque slander. Indeed, an appallingly cynical conception of America’s working poor and the willingness of Tea Party politicians to regurgitate an abundance of boldfaced lies have combined with the enduring American tradition of governmental distrust to foster a disconcerting base of support for those committed to the anti-government cause. The very nation’s commitment to “exceptionalism” at the expense of popular welfare has produced, in its latest manifestation, a detrimental legacy of disregard for the marginalised sectors of society. This tradition of neglect forms an oft-ignored subtext that underscores the increasingly prominent return of rhetoric that fetishizes notions of ‘rugged individualism’ and a disdain for the working poor. Despite the disastrous results of the President Herbert Hoover’s trust in the virtues of self-reliance to guide the country through the burgeoning Great Depression and the absurdity of Reagan’s ‘by your bootsraps’ convictions (we’re still waiting for that wealth to trickle down…), high profile Republicans and Libertarians continue to deliver lines that would make Ayn Rand beam with pride. Once responsible for fostering the immigrant-friendly ‘melting pot’ culture that attracted the world’s greatest scientific and academic minds, America’s fascination with individualism and self-determination forms an integral part of the national spirit (not to mention the second passage of the Declaration of Independence). Today’s ‘Boostrap revival’ efforts, however, have perverted the egalitarian and anti-bourgeoisie aspirations apparent in the spirit of America’s inception. In an ironic move that has pitted the ‘populists’ against the population, shutdown-era radicals of the far-right equate future lower and middle-class prosperity with the eradication of government assistance to those very same groups. We have to look no further than the mid-September bill pushed through the House of Representatives by the GOP majority. The proposed legislation features deep cuts to federal programs that provide assistance (namely ‘food stamps’, which increasingly come in the form of debit-style electronic cards) to those who otherwise cannot afford to eat. The Nutrition Reform and Work Opportunity Act, which features over $40 billion in cuts over the next 10 years to the government’s Supplemental Nutrition Assistance Plan (SNAP), was labelled ‘one of the most heartless bills I have ever seen‘ by Democratic Representative James McGovern from Massachusetts. The Republicans, for their part, have an entirely different perspective. House Speaker (and shutdown celebrity) John Boehner claimed that the bill would make ‘getting Americans back to work a priority again for our nation’s welfare programs’. This sentiment, as well as the bill’s lofty title, would lead you to believe that the bill contains some sort of pro-labor provision that would work to help soften the blow of slashed government benefits to the poor. This, however, is far from the case. When viewing the Act’s contents, any allusions of GOP sympathy for impoverished Americans are quickly dispelled. Boehner’s description of the bill’s utility as a tool in expediting the unemployed masses’ return to work is wildly disingenuous. In place of any remotely proactive initiatives exist a series of draconian measures that highlight the elimination of ‘state performance bonuses’, ‘increas[ed] oversight of SNAP programs for the homeless, elderly, and disabled’, and the consent of the federal government for states to ‘conduct drug testing on SNAP applicants as a condition for receiving benefits’. Voilà, ça y est. Today’s Republicans care little about reinvigorating the working-class foundation of the domestic economy, and much more about preventing the President’s health care bill from coming into effect. The third item of the aforementioned list has featured heavily in recent conservative agendas. The push to mandate drug testing for SNAP recipients does little to discourage the perpetuation of the caustic and bigoted ‘welfare queen’ mythology. It has become increasingly clear that the modern libertarian equates poverty with sloth and unemployment with apathy. The drug testing initiative, in addition to being ethically and morally objectionable, has been shown to make little economic sense. Florida conservatives were temporarily successful in launching a new law that resulted in a four month period of testing in 2012. In a deeply ironic twist, the examinations produced a failure rest of just 2.8%, which resulted in a cost to the state of $118,140. The program, which cost the state more than the expense of the potential benefits to the 2.8% of drug-using welfare-recipients, was deemed likely to have been a ‘constitutional infringement’ by a Federal District Court who discontinued the testing via temporary injunction. The unsurprising results of the Floridian experiment have done little to deter the right wing’s push to further marginalize the American lower classes. Regardless of the matter at hand, be it food stamps or healthcare, it is clear that the anti-government contingent of the GOP will stop at nothing to see the income disparity widen and the downtrodden fall increasingly underfoot. The most recent manifestation of this desire, the government shutdown, has only pushed their pursuit further into the international spotlight. It is becoming increasingly apparent that the far-right is far less concerned with implementing alternative routes towards American prosperity than they are to obstructing ideologically undesirable legislation and attempting to annihilate the reputation of Democratic presidents. The disparity between rich people and poor people in America has increased dramatically since when we started… The middle class has become more like poor people than they were 30 years ago. Adding insult to injury, the push to disenfranchise (see: the recent fight over voter registration laws) and marginalize the American masses is exacerbated by a declining education system. The de-funding of public schools fits neatly into the far-right’s program to comprehensively privatize American life. It also, not-so-coincidentally, functions to inhibit the upward mobility of citizens and abolishes any prospect of ‘bootstrap’-style salvation. A recent report by the Organization for Economic Cooperation and Development has quantified the decline of American academic prowess. A BBC article on the report remarked that the United States represented ‘an education superpower of a previous generation’, where younger generations are increasingly less educated than their parents. This downward spiral has had tangible effects beyond the general ignorance of the population, with the number of ‘highest-skilled’ professionals in the US falling from 42% to 28%. The reality, however, has remained almost entirely irrelevant to the far right. Plummeting levels of education and unprecedented levels of poverty Practicalities do not represent any significant impediment to the GOP’s pursuit of unabashedly ideologically-driven agenda. If anything, the downward trend in education enables the radical right’s pursuit of all things anti-science and anti-modern. Equally, it simply does not matter that their ‘small government’ rhetoric runs completely contrary to drug testing for welfare recipients that costs the state exorbitant sums. The fact that Obamacare is based largely on conservative designs and represents a significant step forward for the American population is equally irrelevant. The commitment to antagonism at the expensive of reason has spawned claims about the Affordable Care Act that cross a line drawn far beyond absurdity and extend well into the realm of nauseating obscenity. The legislation, which functions to expand healthcare provisions to significant swathes of previously-uninsured Americans, has been labelled ‘a law as destructive to personal and individual liberty as the Fugitive Slave Act of 1850‘ by Republican Representative Bill O’Brien. Tea Party leader and architect of the ‘not-quite-filibuster’ Senator Ted Cruz has led the charge among the minority of Republicans committed to a protracted shuttering of the government. In his opinion, the President and Senate Majority Leader Harry Reid are responsible for grinding the government to a half over their unwillingness to ‘compromise’ on Obamacare. The reality, in stark contrast to the Tea Party Senator’s remarks, is that the Patient Protection and Affordable Care Act passed through both houses of Congress, was upheld by the Supreme Court, and was reaffirmed by the election of Obama (in lieu of Mitt Romney, whose promise to ‘repeal Obamacare’ formed the basis of his entire presidential campaign) to a second term. While the shutdown has come as a shock to many, American and non-American alike, it is really far from surprising when viewed from a wider perspective. The current situation has come as a simple product of cause-and-effect. There can be no reasonable expectation of responsibility when ideologues are voted into government. It is not an event that comes without repercussion. It seems especially silly to except the smooth operation of Congress from Representatives that campaign on a platform of anti-government values. When politicians are more committed to the partisan pursuit of destroying the legacy of an incumbent President than they are to providing for the well-being of their fellow countrymen, it becomes absurd to expect a positive result. It is dangerous, though, to think of the Congressional deadlock as the problem, and not a symptom. The shutdown (and possible upcoming default) has come as a direct consequence of the mainstream acceptance of Tea Party politicians and the dangerous extremes that they represent. Most recently, an individual appeared at the anti-Obama protests in front of the White House accompanied by a Confederate flag. This wildly inappropriate gesture in many ways embodies the senselessness and misguided nature of the government shutdown as well as contemporary American politics at large. Despite impassioned cries of protesters, galvanized by an appearance of Tea Party celebrities Sarah Palin and Senator Ted Cruz, the truth that emerged undeterred. In today’s political arena, the reality has taken a back seat to reactionary fervor. Fear and moralizing partisanship have overtaken the practical considerations of governing, and politics has been reduced to a game of who can behave in the most petulant manner. The reckless brinkmanship is well represented in the recent remarks of President Obama, who has continually affirmed that he ‘will not negotiate’ over things like ‘the full faith and credit of the United States’ or ‘whether or not America keeps its word and meets its obligations’. However, it remains quite difficult not to mentally substitute the latter half of that phrase with its more conventional conclusion. In response to the flag-bearer’s breach of decorum, Atlantic editor Ta-Nehisi Coates remarked that ‘If a patriot can stand in front of the White House brandishing the Confederate flag, then the word ‘patriot’ has no meaning’. In addition to the immediate significance, the sentiment is especially poignant in considering the contemporary distortion of traditional GOP priorities. Gone are the days when practical economic considerations drove policy within the Republican Party. While it’s very likely that Congress will conjure up a last-minute compromise to avoid a cataclysmic breech of the debt ceiling, it will not be because any minds were changed. No compromises will be struck, because today’s Conservatives are uninterested in doing so. Pragmatism, like bipartisanship, is a relic of the old GOP. The new Republican party is willing to be defined by a small minority of Tea Party extremists who are, by and large, more concerned with portraying the President as a litany of increasingly laughable evils than they are with improving the country, or, as the previous weeks have demonstrated, even allowing it to function. After reading the shameless attention-grab that was Tim Stanley’s latest Telegraph blog post (Obama and Syria: Britain has helped Obama rediscover the Constitution. No need to thank us, America), I realised that it was not, in fact, the ‘Anarcho-Catholic’ and ‘temperamentally conservative’ author’s attempts at being clever (‘Obama referred to America as a constitutional democracy. It’s a republic, sir, a republic. What grades did he get at college I wonder?‘) that made the largest impression on me. Instead, it was the fact that he considered Obama’s decision to seek Congressional approval for a military intervention to have been a ‘remarkable performance.’ The notion that the President’s decision to seek out the proverbial ‘green light’ from Congress is at all controversial is deeply worrying. While the school of thought that considers unconstitutional every post-Second World War American armed conflict (John Nichols writes that ‘no president since Roosevelt has respected the Constitution sufficiently to seek a formal declaration of war.’) fails to account for the insufficiency of archaic international institutions, political assumptions, and legal norms, it certainly seems more lucid than the alternative. As House Republican Peter King sees it, Obama is ‘undermining the authority of future presidents’ by not acting unilaterally in lobbing cruise missiles into the Syrian conflict. ‘The president doesn’t need 535 Members of Congress to enforce his own redline‘, he argues. But at what point was the Commander-in-Chief given the power to draw these red lines in the first place? Finally, and most importantly, Epps emphasises the fact that international law is ‘very much a part of the constitution’ (see, for example, the Supreme Court’s recognition of international treaties in relation to the Supremacy Clause [This Constitution, and the Laws of the United States which shall be made in Pursuance thereof; and all Treaties made, or which shall be made, under the Authority of the United States, shall be the supreme Law of the Land…]), and, as such, war can not be used as mechanism of foreign policy. In any case, I do not find persuasive arguments that place a higher importance on defining the words ‘declaration’ and ‘war’ than on the notion that the Constitution has provided the United States Congress with the responsibility (emergency situations notwithstanding) of deciding when military action is appropriate, and when it is not. Even a cursory glance at the eighth section of the very first article will give the impression that Congress was to be given the responsibility of authorising the use of what has become the world’s most powerful army. I believe that unilateralism, in its various manifestations, is the quintessential problem with contemporary American foreign policy. That is to say, I think it is the most fundamental flaw. A lack of regard for the opinions of the rest of the planet is the culprit behind such a staggering proportion of the world’s (freely substitute: “Intellectuals”, “Europe’s”, “the United Nations'”, etc.) problems with the last remaining superpower. It is so rare to encounter individuals who harbour a genuine aversion to the concept of humanitarian intervention, though it is equally rare to find someone who believes that the United States has done a stellar job of spearheading such efforts. Similarly, the question should not, as Kerry and company have indicated, be centred around whether or not President Obama reserves the right or privilege of commanding the military into action. Instead, I propose, it should be about whether doing so would be such a good idea after all. American politics are certainly an acquired taste. The high-profile spectacle of the American party-politics can be difficult to understand and even harder to ignore. The country’s sheer size (in both a demographic and geographical sense) means that the supply of talking points rarely runs dry. While it may be true that the problems vexing the United States (think: gun violence, gay rights, racial tension) are not uniquely American problems, the country’s colossal scale and well-funded media machine foster a sensationalist culture that fuels larger-than-life perceptions both at home and abroad. While the average bystander would be quite reasonable in dismissing the whole of American politics out-of-hand as being laughably conservative, the reality is indeed a bit more nuanced. The feeling of familiarity that has accompanied decades of widely exported American culture has worked to further entrench and encourage a casual (if not the reductivist) understanding of American politics in the rest of the world. The legacy of the United States’ hegemonic status during the Cold War era has imbued much of the contemporary educated world (especially that which exists across the Atlantic) with a certain sense of laziness when it comes to confronting American domestic developments. It’s certainly easy to base one’s conception of the political scene around the dichotomy between a small minority of culturally enlightened coastal inhabitants stuck in perpetual resistance against the neo-conservative whimsy of the uneducated, gun-toting, red-necked, evangelical masses. However, this fails to account for the quiet majority represented by ‘Middle America’, arguably the most potent electoral force in American politics. It’s indeed this sort of citizen, unremarkable to the news media at large, that serves to characterize the system. While the spectrum seems to be polarizing itself at an alarming rate during its quiet slide to the right, the average voter’s convictions are still far a cry from anything that is being parroted at excessive volume from whomever Fox News has appointed pundit-of-the-week. Despite the best efforts of the far right to stymie the flow of newcomers, America remains at its core a nation of immigrants. The notion of the ‘melting pot’ society is something that gives the Unites States a sense of individuality, a cultivated cultural identity that differentiates it from other members of the English-speaking world like the United Kingdom and Canada. The most recent manifestation of this issue has come in the form of Congress’ attempt to formulate new reforms on immigration legislation, a prospect met with resistance on all sides. Continuing the trend of Congressional gridlock, staunch opposition has arisen among House Republicans. While the proposed reforms include changes that many would deem ‘victories’ for conservatives, the antagonistic fringe of the Tea Party-right has come out en masse against the legislation without providing any insight into how the problem might be resolved, per usual. What is most important about these voters is not their current predilection for Democratic candidates, however, but rather the deeply held progressive beliefs underlying their voting preferences. The progressive beliefs of these young adult voters could recast the core ideological battles that have defined our country’s post-Vietnam political discourse. On the non-Presidential contentions du jour of American politics, the divide is equally maintained. A Washington Post/ABC News poll (above) again illustrates the rather sharp divide between the generations. I believe that these three issues are quite appropriate in illustrating this phenomenon as they represent a sharp departure from the social status quo as well as the shifting social norms of the Millennials. The study shows a significant divide between the Millennials (18-29 demographic) and their parents (50-65+) with the latter half of Generation X (those too young to be parents of Millennials: born after 1965 but before 1979) displaying a slightly left-leaning bias that characterised Middle America in the 2012 elections. Most fundamentally, [political allegiance] is an attitude, not a demographic. In any case, the ‘two-steps-forward-one-step-backwards’ brand of progress that has defined American civil and political culture during the last half-century and beyond will be incredibly difficult to dislodge. It’s certainly far too early to proclaim the inevitable death of the American right. The second Bush President and current House of Representatives have proved that ill-conceived policy choices have no bearing on the GOP’s longevity. As a result of its tremendous size, fickle culture, and unique history the U.S. will undoubtedly continue to struggle with many disputes that are simply non-issues in smaller, wealthier, and more welfare-inclined nations. Nevertheless, the Millennial generation has brought with it a cause for legitimate, if still cautious, optimism regarding America’s progress towards a positive political future. As a life-long nerd, I’ve followed the development of online piracy and the ensuing industry backlash since the days of Napster (which, I might add, was developed by Shawn Fanning, a high-profile dropout of my alma mater, Northeastern University). The advent of publicly-available, affordable, and easily-accessible broadband internet and the introduction of file-sharing software to the mainstream user have ushered in a new realm of intellectual property challenges. The spectre of widespread online piracy has emerged as a thorn in the side of entertainment and legal entities worldwide. On the more aggressive end of the prosecution spectrum, you find agencies such as the American Department of Homeland Security’s Intellectual Property Rights Center (DHS IPR) and its long list of partner agencies. [1. http://www.iprcenter.gov/ ] Among the DHS’ most visible ties are those to the Recording Industry Association of America (RIAA), which is most notorious for its string of hawkish and costly lawsuits throughout the mid-2000s. The series of lawsuits emptied their pockets to the tune of $64,000,000 over a three year period, while only to returning a paltry $1,500,000 in damages ($1.5 for every $64 spent), [2. http://www.techdirt.com/articles/20100713/17400810200.shtml] and pursuing legal action against high school cheerleaders (after labelling them ‘vexacious’ after not agreeing to settle for $200 per song). [3. http://www.wired.com/threatlevel/2008/10/riaa-decries-te] For a comprehensive look at the RIAA’s legal crusade between 2003 and 2008, check out RIAA v. The People: Five Years Later on the Electronic Frontier Foundation’s website. The entertainment faces a significant reshuffling with the dawn of quickly accessible online content. No longer are the industry’s middle men be able to extort exorbitant fees for an obsolete service. Equally, rights-holding companies will be less empowered to use the technical limitations of media ‘artifacts’ (i.e. CDs, DVDs, etc.) to maximise profits and resist technological progress until it is economic convenient. As a result, a series of comically absurd anti-piracy advertisements have been produced, as seen below. …as well as the Motion Picture Association’s much-lampooned ‘Piracy, It’s a Crime’ campaign. The notion that motor vehicle theft and downloading unlicensed media exist in the same legal realm is rather absurd. While the circumvention of legal avenues for acquiring media is at best a snub of the social contract and by no means something that should be encouraged or perpetuated, nor is it something that can be effectively advocated on ethical grounds, the knee-jerk reaction that ‘piracy is bad for the entertainment industry’ may not be as cut-and-dry as it initially appears. Allegations of lost profits made by the various trade associations (and government agencies on their behalf) fail to take into account the reticence of the industry to accept the new order that began with the modern internet. As peer-to-peer networks have demonstrated, there is absolutely no need to provide the consumer with physical media any longer. To claim that this has no impact on the products final cost is rather absurd. I would argue that media is now much more susceptible to legitimate market forces, as consumers are now able to obtain the film or album in an illegal manner with little to no additional effort. Compounding things is the fact that the entertainment industry’s attempt to halt technological progress with the invention of the DVD, it’s not only becoming easier to acquire things illegally, but you’re often left with an equally high-quality piece of media without having to first invest in expensive and superfluous ‘flavor-of-the-month’ hardware with which to play the media. Ironically, those who choose to view the media illegally also avoid the un-fast-forward-able anti-piracy messages that plague the first thirty seconds of DVD offerings. What’s the point of all of this? You certainly don’t have to declare yourself a fan of illegal downloading to participate in the ongoing dialogue regarding the evolution of intellectual property, the entertainment industry, and most importantly, the willingness of governments to devote valuable resources to the prosecution of those who choosing to commit illegal acts that have been demonstrated to have little consequence on society at large. It’s at this point that parallels can be drawn to the failed War on Drugs. In the same way that one can support the redirection of government funding and energy away from the futile and destructive battle against illicit drugs without actually supporting their use or taking them personally, it’s possible to speak out against government subservience to legal teams of the entertainment industry and the conscious effort to impede technological progress and the benefit that it brings consumers without actually participating in the activities yourself. While the moral and ethical arguments against the infringement of intellectual freedom touted by prominent actors such as Kim Dot Com (of Megaupload fame), the Pirate’s Bay trio (Gottfrid Svartholm, Peter Sunde, and Fredrik Neijj) [8. TPB AFK: The Pirate Bay Away From Keyboard, a documentary about the three founders of the Swedish file sharing monolith can be found at http://www.youtube.com/watch?v=eTOKXCEwo_8], and Anonymous can be difficult for the average internet user to identify with, they do not detract from the importance of the larger debate. The recent mass-market appearance of technology like the 3D Printer only increased the stakes of this debate, as the nexus of file-sharing and intellectual property will involve an even more immediate assortment of real-life consequences. The new ground being broken by today’s legal debates has the potential to set a series of precedents for years to come. How will the issue change when the average citizen can download the plans to ‘print’ an assault rifle? In what ways, legally-speaking, will that data be treated differently from a unpurchased film? While we have the distinct generational privilege of witnessing the debate unfold in front of our eyes, I’m optimistic that our children’s children will be able to watch it online, instead of buying the DVD. While I fully intended for my first substantial post to cover a topic that has more of an international relevance, I felt as though the immediacy of the Zimmerman trial and tragic circumstances of the final hours of Trayvon Martin’s life warrant a few words on the subject. The controversial decision of the jury to acquit George Zimmerman of all charges and criminal culpability in the shooting death of Trayvon Martin has reignited the fleeting contemporary American dialogue on the difficulties of being non-White in America. Regardless of the effectiveness of the prosecution’s arguments in proving ‘beyond reasonable doubt’ that Zimmerman took Martin’s life in a malicious and/or pre-mediated fashion, the decision continues a dangerous and detrimental precedent in terms of society’s tolerance for violent interactions, especially those of involving African-American victims. While Zimmerman was dismissed by Judge Debra S. Nelson of Seminole County and told that he ‘has no further business with the court’, Marrisa Alexander, a thirty-one year old mother of three was given distinctly different treatment by the Floridian justice system. Despite not committing a crime anywhere near as serious as the slaying of an unarmed youth, Ms. Alexander was given a 20 year prison sentence (keep in mind: that’s 20 more years than Mr. Zimmerman received). Her offence? Firing a bullet into a wall to scare away her ex-husband who she believed threatened her safety. [1. http://www.huffingtonpost.com/2012/05/19/marissa-alexander-gets-20_n_1530035.html] This stark dichotomy is nothing new, though. It’s only the latest episode in a continued narrative of inequality in today’s American society. Having spent a significant portion of my formative years in a city that hosted the largest racially-motivated riot since the Rodney King riots in Los Angeles (coincidentally the other city in which I grew up), I feel as though I have no lack of personal experience with the issue of race in America.[2. http://en.wikipedia.org/wiki/Cincinnati_riots_of_2001] As a teenager I participated in demonstrations, school walk-outs, and other various forms of protest against the perpetuation of the glaring disparity in police action (read: violence) against African-American citizens (especially men in the younger demographics) compared to their white counterparts. While things have calmed significantly in and around Cincinnati over the past few years, the larger problem remains. The striking discrepancy between the treatment of inner-city African-American communities and their suburban white (and young urban professional) counterparts persists as a highly-visible relic of Jim Crow-era bigotry. The difficulties for the YBM (Young Black Male) in America don’t stop with the police, however. In addition to dealing with nearly omnipresent racial profiling (for an easy example, see studies done on New York’s ‘Stop and Frisk’ program and wildly disproportionate incarceration rates [4. According to a 2009 Bureau of Justice Report, ‘Black non-Hispanic males, with an incarceration rate of 4,749 inmates per 100,000 U.S. residents, were incarcerated at a rate more than 6 times higher than white non-Hispanic males.’ http://www.bjs.gov/content/pub/pdf/pim09st.pdf], the YBM must cope with entrenched social structures and other factors that discourage success. According to the Schott Foundation for Public Education, the four-year graduation rate for YBMs that received their diplomas in the 2005/2006 school year (which, for argument’s sake, is the year I myself finished) was still below 50%. The report states that the ‘one million Black male students enrolled in the New York, Florida, and Georgia public schools are twice as likely not to graduate with their class as to do so.’ [5. http://www.schottfoundation.org/drupal/docs/schott50statereport-execsummary.pdf] If these numbers aren’t cause for a widespread genuine national debate, I really don’t know what is. The election of Barack Obama in 2012 certainly marked a milestone in the continuing battle for equality. Equally, however, the pervasiveness of the ‘birthers’ and other inane detractors have proven that the claims of America’s attainment of a post-racial society upon Obama’s inauguration were wildly premature. While the present-day paranoia over Islamic terrorism has produced plenty of its own prejudicial quagmires that our nation is only beginning to confront, it’s absurd to pretend as though it has somehow magically supplanted the need to solve our racial problems of the past. As recent events have shown, we are certainly not living in the post-racial utopia that certain politicians and social darwinists would have you believe, in fact it’s quite the opposite.